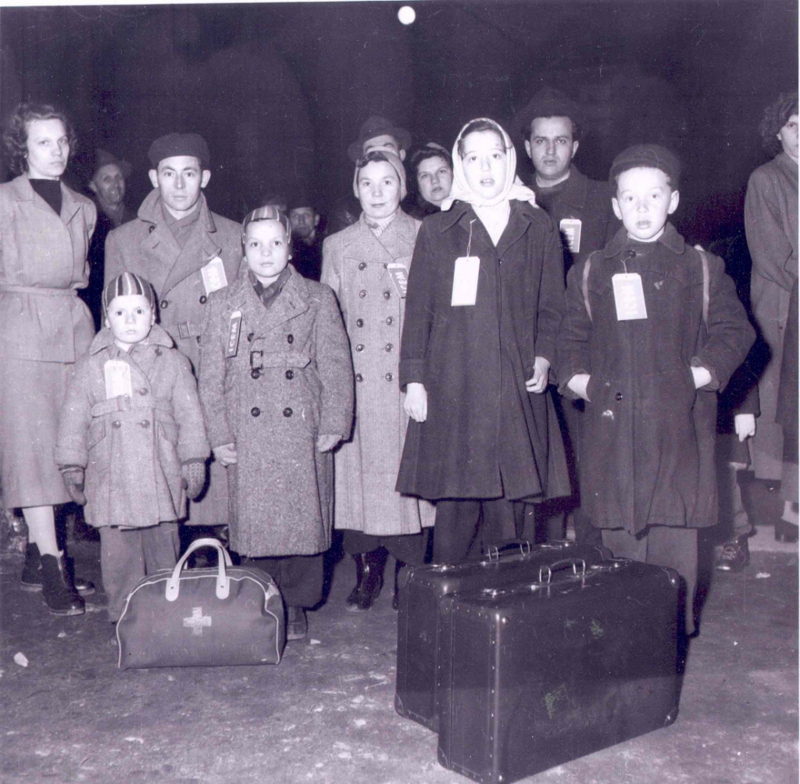 Hungarian Refugees arrive in Canada, 1957. Archives of Ontario. F 1405-19-60, MSR.14500. Separated by a mere five years, these two statements reveal much about the historic contradictions of the Canadian approach in dealing with refugee crises. In fact, remove the dates and these statements would not seem out of place in the current Canadian divide over the global refugee crisis in which there are more than 60 million people fleeing war, persecution, and danger. This is a number that surpasses the amount of displaced persons at the end of the Second World War, when my father and my grandparents fled Hungary by train and horse-led wagons to come to Canada in April of 1951, but not before spending six years stateless in Austria. They were among the 120,000+ refugees who made their way to Canada between 1947 and 1953 thanks to contract labour schemes or government, family or church group sponsorships. Make no mistake, the selection criteria were guided by racial and political bias, along with a heavy dose of economic self-interest. Refugee origins & destinations. Thomson-Reuters, 2015. Fast forward to today and a United Nations report reveals that Canada is at the bottom of a top-15 list of industrialized receiving countries, with 13,500 claims reported in 2014. In comparison, Sweden, a small Nordic country with 9.6 million people and a quarter of Canada’s population, admitted 75,100 refugees last year. In January the Conservatives pledged to accept 10,000 Syrian refugees over a period of three years, of which Immigration Minister Chris Alexander reported 2,500 are now in Canada. In a crass display of politicking last month, the Conservatives promised to increase this number by an additional 10,000 over four years if they are re-elected in October. Sadly, this is a meaningless number, amidst an increasingly shameful Canadian response to ongoing refugee crises over the last 15 years. We weren’t always so unwelcoming, but nor have we offered an open door since the end of World War II. I would argue that the reputation we have (or had) as a world leader in protecting refugees is due largely to the concerned Canadians who have called on our political leaders to ‘do more’. The UNHCR recognized this when it awarded the Canadian people the Nansen Medal in 1986. While the Hungarian refugees were fleeing a Communist state and welcomed as democratic refugees, Chilean refugees fleeing a fascist state were viewed with suspicion. 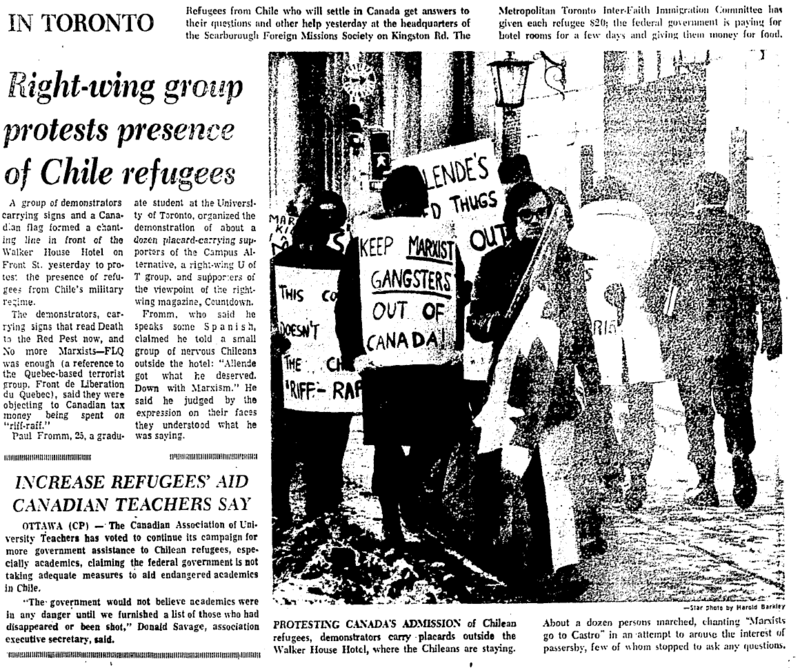 In 1973 over 7,000 Chilean and other Latin American refugees were admitted to Canada after the violent overthrow of Salvador Allende’s democratically elected Socialist–Communist government. Chilean and non–Chilean supporters of the old regime then fled the oppression directed against them by Chile’s new military ruler, General Pinochet, in the wake of the coup. Although Canada took the refugees in, it did so grudgingly—at least initially. Despite pressure from Amnesty International, church, labour, and Latino groups, the government was slow to react, not wanting to antagonize Chile’s new administration and the United States, which had deplored Chile’s slide into economic chaos under Allende. Many in the Pierre Trudeau government painted the Chilean refugees as subversives and dangerous to Canada. This was certainly out-of-step with the views of the Canadian population, many of whom were urging the government, by way of various organizations, to accept the refugees as they had done during past crises. The government was also out-of-step with the efforts of other nations, including Holland and Sweden, who treated the Chilean refugees outside the normal flow of immigrants. Only after considerable outcry from various civil society groups did the situation change. Mixed reception for Chilean refugees. Toronto Star, Jan. 14, 1974. By mid-1979, nearly 1.5 million refugees had fled their homes in South-East Asia. In June of 1979, the Canadian government announced that 60,000 Indochinese refugees would be resettled by the end of 1980. Thousands of Canadians came forward to welcome refugees, giving a dramatic launch to the new Private Sponsorship of Refugees Program. Popular pressure forced the government to adjust upwards its initial commitment to resettling the refugees. For the years 1978-81, refugees made up 25% of all immigrants to Canada. So here are some numbers, again: in 1956 we took in some 37,000 Hungarian refugees. In 1968 we took in 10,000 Czechoslovakian refugees in the aftermath of the Prague Spring. 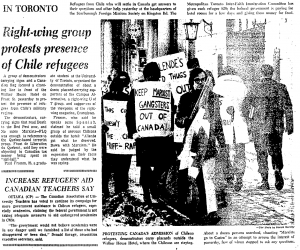 In 1972, 8,000 Ugandan Asians were welcomed to Canada, and then about 60,000 Indochinese ‘boat people’ were also welcomed as refugees. In the 1990s over 11,000 refugees from the breakup of Yugoslavia made their way from Bosnia and Kosovo to Canada. And in the past decade nearly 14,000 people fleeing the ongoing civil war in Colombia have come to Canada. How many refugees is the right number? What is the right number? There’s no right answer, of course. 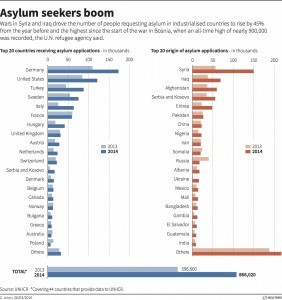 Let’s face it; our record is mixed, even as most Canadians seem to favour asylum provision. No one should forget that in 1930s Canada, “none [was] too many” for Jewish refugees fleeing Nazi Germany. We’re working on a series on refugees and history, starting with this great post by Stephanie Bangarth, and continuing after the long weekend. We’ve got 4-5 more posts lined up for next week and would like to include some more perspectives. Please email info@activehistory.ca or forward this request on to historians who might be interested in contributing an op-ed style post. I remember the Kosovo refugees arriving in Canada in 1999 I believe, when I was still in high school. They were going to be housed temporarily on a military base a few miles from where I lived. I recall my classmates and I being really proud that we could help them, as if we’d had anything to do with it. I also recall being rather flattered by the idea that people from so far away might like to join our society. It seemed a reflection on something we had collectively done right, to build a community someone might like to join. No idea what happened to those people. I never met any of them. But none of us ever thought of them as a threat to local employment, or the public purse. Good read! I have always felt that Canadians are good host, accepting their guests with glee. I personally know a few people who are descendants of Hungarian refugees to Canada in fifties. The fact that how well those people are living now shows how good people Canadians are. But recent Syrian refugee situation wasn’t of a same kind. Although people are getting shelter and food from the government, some of the refugee lawyers like http://www.maxberger.ca/ confirms that Citizens are not as warm in their welcome this time. Many of them are scared or worried that these refugees will take away what is rightfully theirs. I just hope all those worries will go away and Canadians accept their new guests just as their previous ones. Interesting comments regarding Canada’s recent history relating to refugees. All too often Refugees are viewed the same as the other immigrant categories and rarely does any research include the movement of “illegals” who enter the country, usually under false pretext and who eventually stay and integrate within society. Of course it is difficult to calculate the latter as Canada does not have “exit controls”. 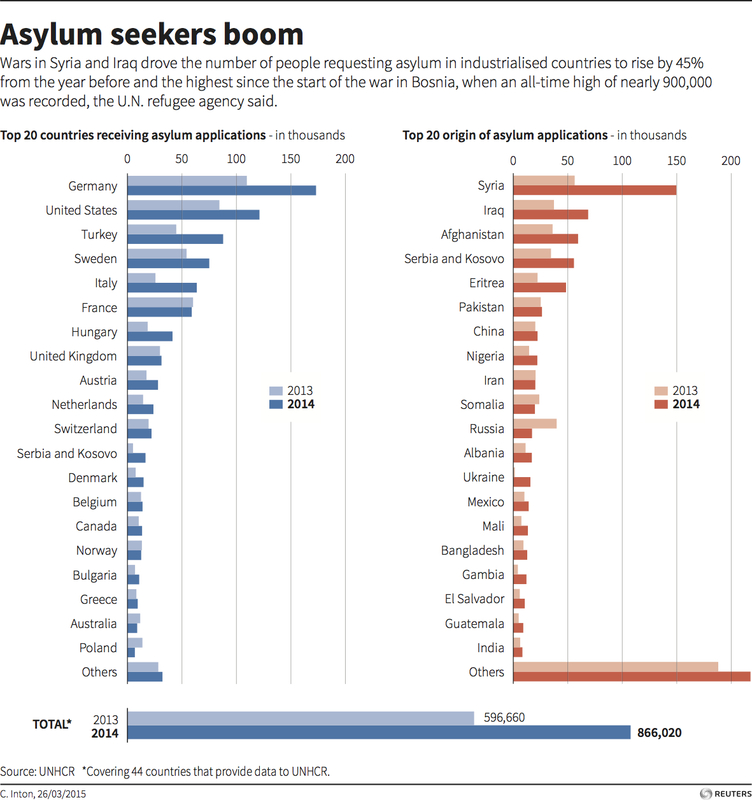 To present a more accurate history of Canada’s humanitarian role on the world stage, it is important to includes much of the relevant data (Including asylum seekers), family class, investor categories etc… This will then serve to reflect Canada’s annual mix of new arrivals who have “chosen” or “accepted the offer” to make Canada their new country. Technology is also playing a significant role in sharing information and should be studied in relation to the historical impacts where, as an example the Hungarian movement was based on word of mouth and newspaper, the Indo-chinese (boat people) were influenced by television, radio and telephone, whereas, the 1999 kosovars had cell phones, social media and the internet. The recent European migrant crises wii inevitably force many countries to re-think and redefine the movement of people in an era of globalization with the ever-increasing power of social-media.